So when I set out for a ride in the North Mills River area of the Pisgah National Forest this morning, I did not plan on setting some sort of course record on my route. It was just a chance to get into some parts of the forest that I don’t normally ride in. Also, people from all over come here to ride bikes, so I feel pretty lucky to be able to do it from home. My route started on what is lovingly referred to as “the never-ending road.” This overgrown gravel track seemed to live up to its name when I rode it earlier in the spring. On this ride, the leaves blocked enough of the direct sun to make the trip a bit more pleasurable. 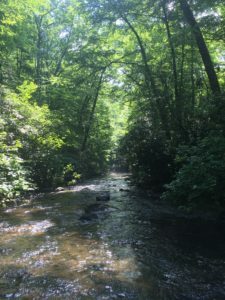 I was surprised and excited to get to the Fletcher Creek trail as quickly as I did. There is a town named Fletcher on the other side of the Mills River valley from where I was riding. I don’t know if that’s where the creek and eponymous trail get their name. It could also be from the Fletcher family, from whom the town gets its name. But whatever. The trail is a ton of fun to ride. I have never been surfing, but riding this trail is what I imagine surfing to be like, with it’s banked twists and gentle drops. I used to ride this trail years ago, and this is the second time since I moved back to Western North Carolina. Given my lack of skills and talents for mountain biking, riding the same trails helps me get to know and enjoy them without breaking my neck. Speaking of which, at an intersection of two trails I decided to switch over to Spencer Creek because the Fletcher Creek trail takes a sharp climb followed by a steep, rocky descent. I did not feel like risking either my neck or my collar bone today, so despite some misgivings from somewhere deep in my memories, I headed down the path also taken. And then I remembered the thing about the Spencer Creek trail: it’s built into the side of a hill. That alone is not so special, but the slope is relatively sheer. The trail is skinny and there’s a drop-off to the left. For whatever reason, I tend to put my left foot down if I ever feel like things aren’t going well on the bike. In this situation, there would be nothing but air for my foot — until, of course, I started tumbling down the hill. Now, a better mountain biker than me would not have a whole lot of issues with this trail, but I’m not better than me. So I was in a bit of a pickle. My best alternative was to chalk it up as a lesson learned and continue to be grateful just to be here. I managed to get to the end of the trail, at a point where the Mills River is impounded to provide water to the City of Asheville (that’s a whole other sorry tale) and a nice, wide gravel road descends to meet you. Don’t ever look a gift road in the mouth. I did. The mist rising off the river was, actually, quite pretty. Now I was on the wrong side of the river, so I knew I’d have to cross again to get back to the car. That was ok. It’s all part of the adventure, right? But then I had to cross again, putting me back on the wrong side of the river. Live and learn. At least I’m out in the woods on a pretty day. And, hey, there’s a dog! Dogs can be problematic because I don’t know how they will respond to bikes, especially when that bike gets between them and the person who feeds them on the reg. This one seemed cool though, so I peddled on towards it’s owners who also seemed cool. As I navigated through their midst, they mentioned that they had seen a rattlesnake up on the trail. I like snakes even less than I like a sidehill trail that falls off to the left. My plan was to just keep riding. They did not seem to have been bitten, and I might not even see the snake. When I saw the river crossing up ahead, I though I had made it. Snakes don’t cross rivers, right? (They probably do, but I’ll do anything to rationalize my way out of a snake encounter.) It was the first crossing in a while that I was happy to see. On the far bank, I got up in the saddle and started to peddle. Right past a snake with the largest head I have ever seen. I screamed. It jumped. I peddled as fast as I ever have. There was another river crossing up ahead. Thank God. Snakes don’t cross rivers. I was starting to think they had a point. Crossing rivers was getting old, and I was on the wrong side at this point. Once I got back to the side where my car was, I was staying on that side come what may. Until the trail bent back into the river. Why? This can’t be right! I looked to my left, and there was a trail of gravel up the bank. Exodus! I followed it up and there was a manhole cover. The water pipeline to Asheville! Surely I could follow this to civilization. 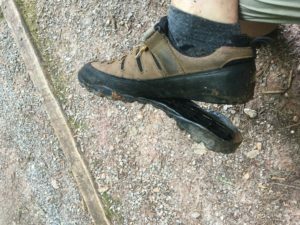 At some point in all of these water crossings, the sole of my 21 year old bike shoes became disconnected from the upper. Is Shoe Gu still a thing? With a machete and a sturdy pair of boots, perhaps one could make a path, but not with a Trek Marlin 7. When the trail petered out and the pipeline plunged into the mountain laurel, I had to admit defeat and turn around. Still, I had not seen a blaze in a while and there was no way to know if crossing the river, again, would get me where I wanted to go. Of course, going back meant another possible encounter with the snake. There was clearly no alternative but to push on. 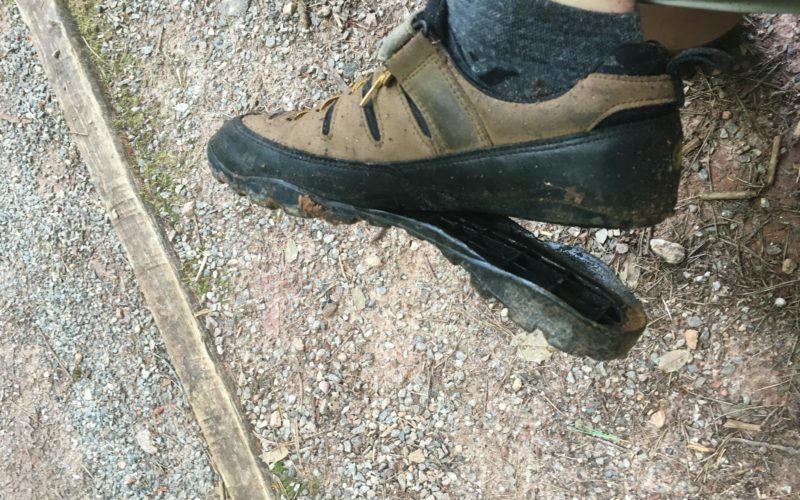 While the sole of my shoe slapped the ground on each peddle stroke, I began to wonder how the newspapers would remember me, a mediocre mountain biker, last heard shrieking at a snake and found with 3/4ths of his shoes. Then, like the first rays of sun over Ft. McHenry, signs of my salvation showed up. The first in the form of a blaze saying that I was, in fact, on the right trail. 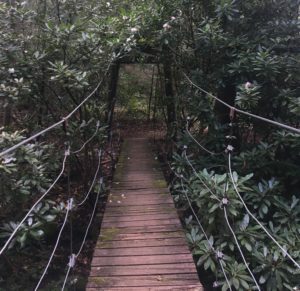 The next was an iconic suspension bridge that meant I should be close to the Trace Ridge trail which would take me to my car. But of course, Trace Ridge had been rerouted and would take longer than I expected. I did not care. Nothing mattered anymore because I knew I would finish this ride and go eat pizza. The new trail was another sidehill confabulation, but the drop-off was to the right so that was fine. There was even a climb too steep and slick with packed mud to ride. So what? I had lived. I had learned. I would be back. But I will ride a different route next time. Posted in Archives, Go Pre!•Leave a Comment on Well, that escalated incrementally.